You might ask…what did I do? 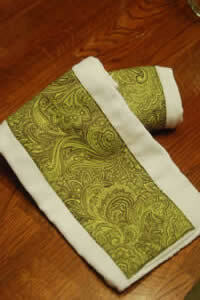 I made burp rags…or at least made them more pretty. I cut the fabric to 19" x 5" and then folded and pressed the edges in. I applied heat and bond to the fabric, then applied the fabric to the cloth diaper and iron it on (the heat and bond makes it stick). I then sewed around the edges with a brown thread. Yup, as easy as that. I elected to leave a little white at the bottom so I wasn’t trying to go over the seam of the diaper itself. 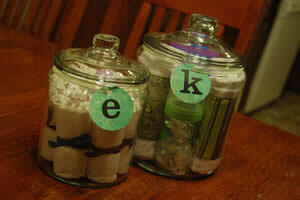 The smaller jar contains rolled diappers tied with a ribbon and lavender lotion. The larger jar has 2 burp rags, a bottle, some formula, and a formula dispenser. The baby shower is next week. Hopefully the decorations for the shower can turn out just as cute. Any good ideas (I was thinking about going with a green and brown theme with circles. Not sure from there, but I am sure it will all come together:) ). One Response to A bit of craftiness. What cute ideas! I am throwing a baby shower for a girl in our ward in a few weeks and just might steal your gift idea. Too cute!